While I wait for some of my more uh, interesting projects to upload, seeing as the popularity of video uploads is driving up conversion times across the board, I thought I would briefly review a book I’ve been reading. 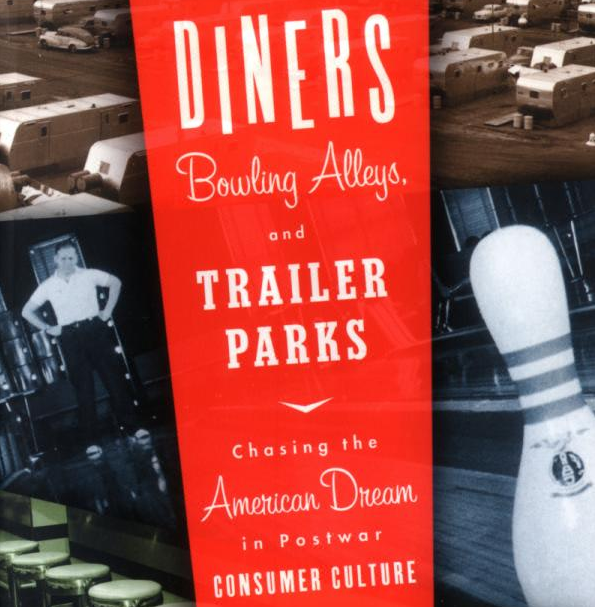 It’s called “Diners, Bowling Alleys, and Trailer Parks: Chasing the American Dream in Postwar Consumer Culture.” It’s no secret that I’m obsessed with such strange things. This book was sort of a birthday present to myself (just turned 25 on Friday, which was Day 1 of an excellent three-day weekend) and I thoroughly enjoyed it. It was purchased in a lovely bookstore in Atlanta’s Virginia Highlands neighborhood. By the time Sunday afternoon rolled around, and I had spent Saturday getting through much of this book, I picked up some “tiki room” styled art and a cheesy PEZ sign at the Inman Park festival before dashing out to escape the rain. I have to think that my purchase inspiration was this book… here’s what I learned. First: I’d never heard of Pinboys before, but apparently setting bowling pins was a highly undesirable job back before the automated pinsetter was invented. Thanks to that, we could bowl and live happily ever after. Second, I guess I’d never given much thought to trailer parks or stereotypes, having long seen so-called “Snowbirds” flocking to the Phoenix area each winter like some sort of annual ritual, traveling as they do in their intermittent caravans of fifth-wheels. (Quartzsite is an example of the RV hobby’s popularity in the state.) All in all, for someone like me, this was heavenly. I really loved the diner pictures, too. I’m kind of an enthusiast. Passing by the Majestic diner in Atlanta’s Virginia Highlands neighborhood on Friday afternoon took me back in time.